My journey to Ramlila Maidan today morning as usual started with a ride in the metro my destination being the New Delhi Metro Station which is the closest to the Maidan. I was there last Sunday too. 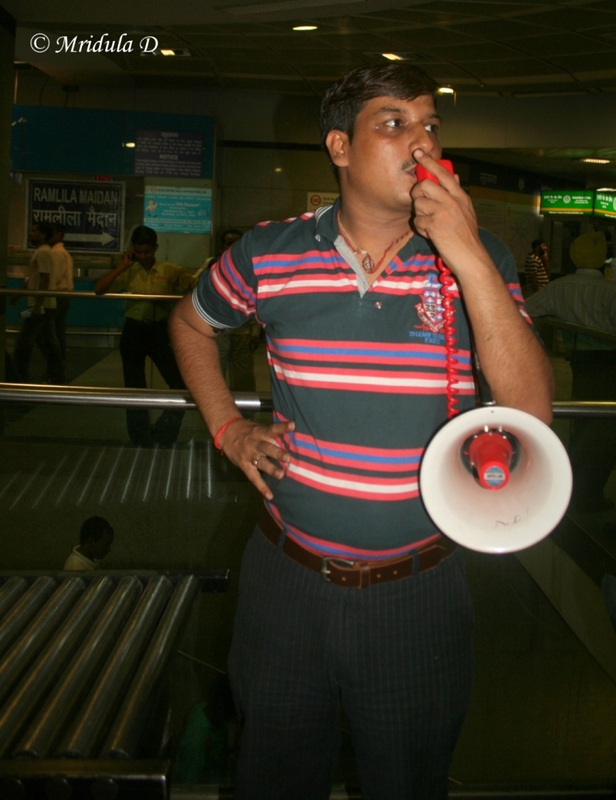 So I was expecting the people with megaphone this time to manage the crowd and give directions. As soon as I exited out of the metro station flag painting was the most popular activity today. 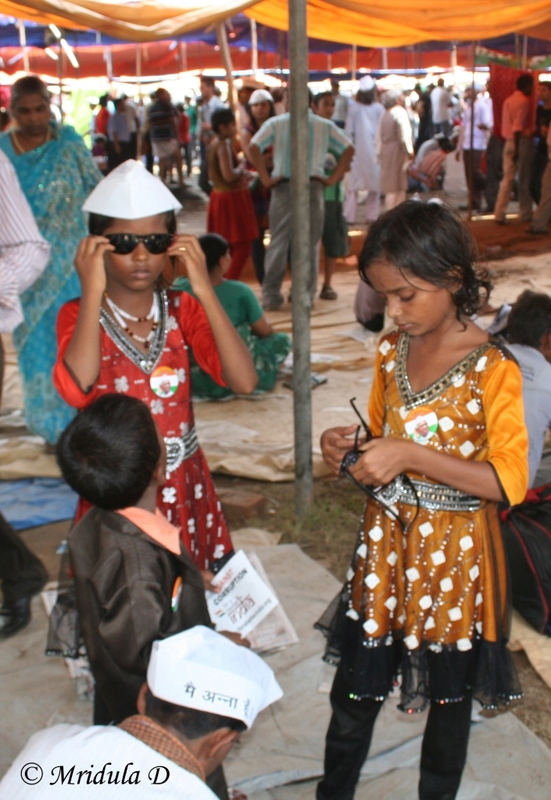 that is not to say that caps or flags were not selling but face painting was by far the most dominant activity. 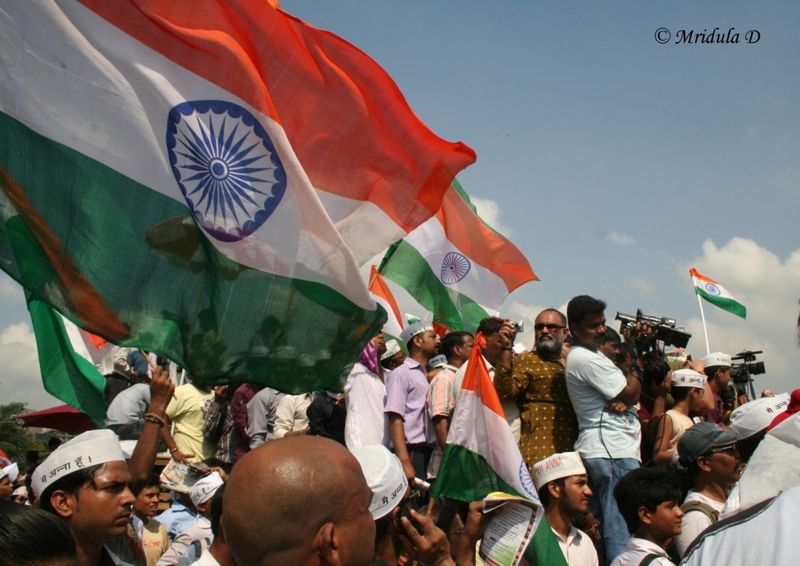 It was another matter that on a hot and humid day as today many had colors running down their faces by the time they came out of the Ramlila Maidan. 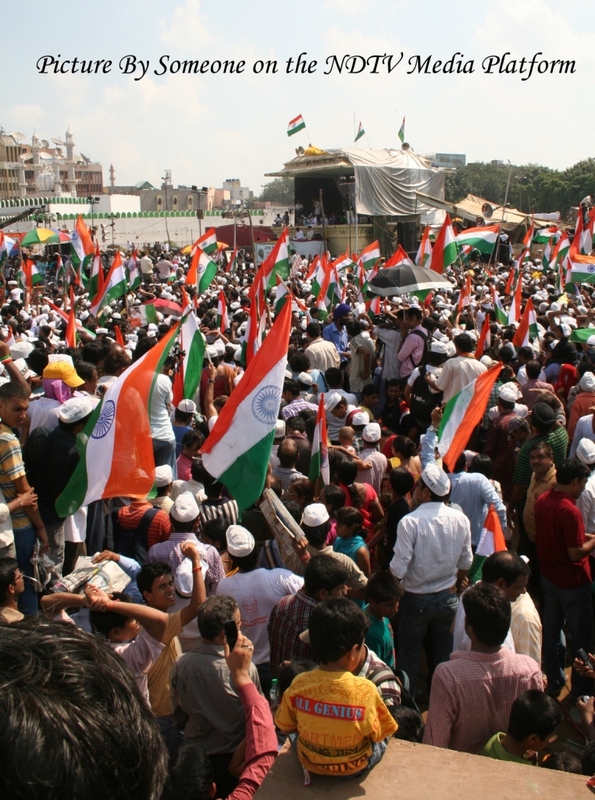 Once again there was a huge queue to get inside the Ramlila Maidan but it was in high spirits. People among other slogans were reciting Sarfaroshi ki Tamanna quite a lot. 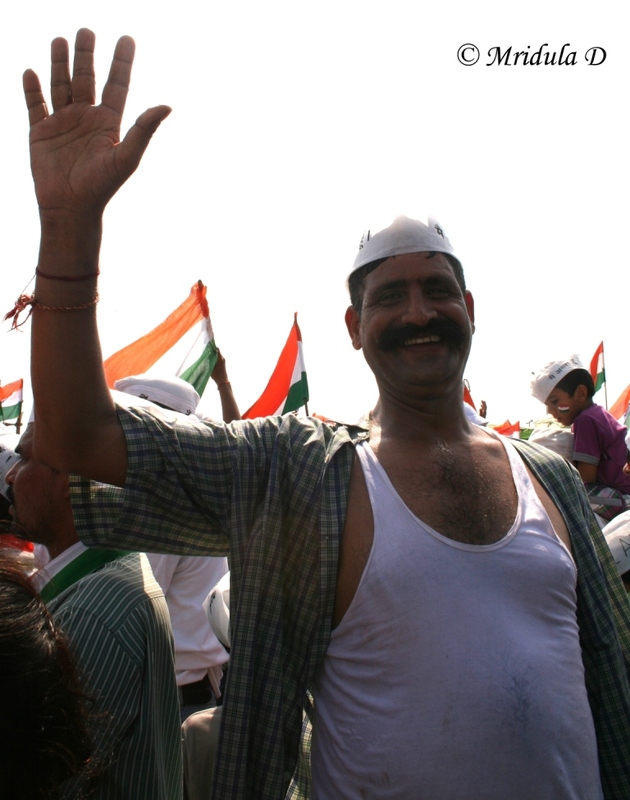 overall people kept their humor and patience in very cramped spaces and on a very humid day. These kids were fleeing the confined spaces and the sweat flowing freely all around because of the humid day by moving on the wall! My theory is that some media enclosures were friendly an would let people crowd their raised platforms whereas there were others which kept their enclosures empty. 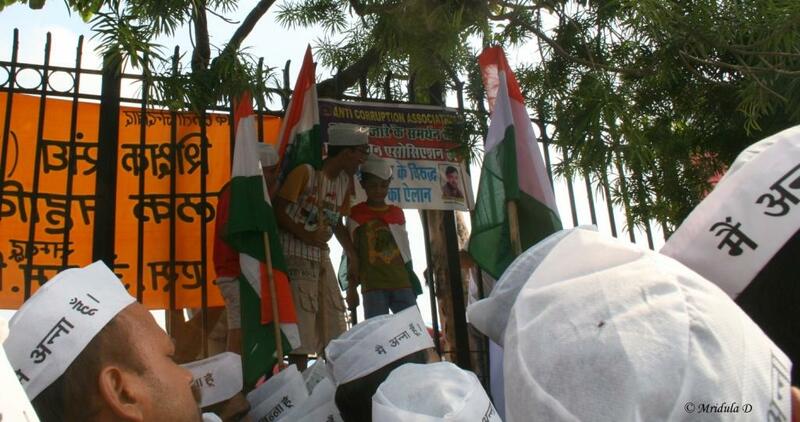 I do not know which media outlet this one belonged to but it was surely in the crowd friendly camp. 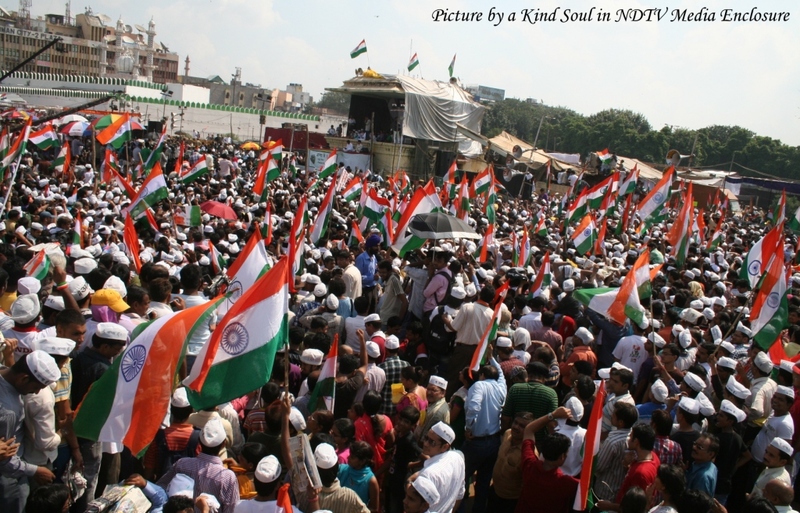 And there was so much crowd that unless you had an elevation point or the front seats the view of the main pandal was out of question. The other elevation points were tress but I did not try climbing any. 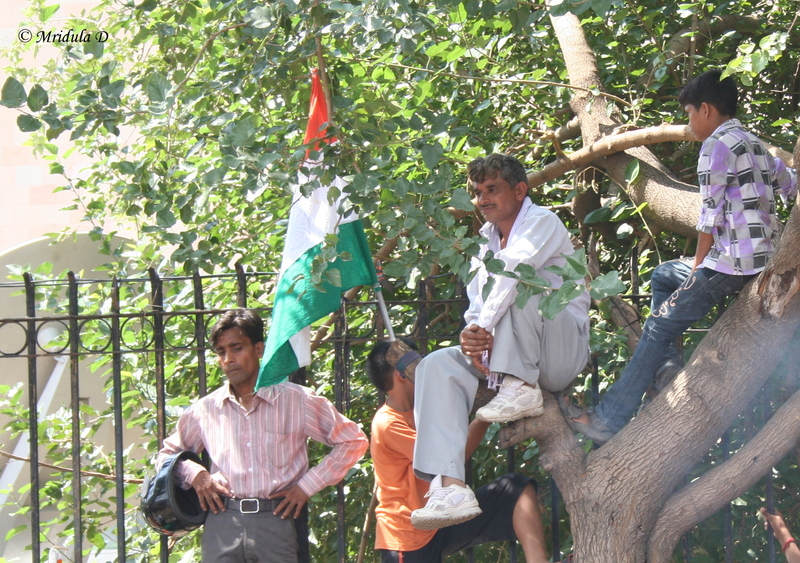 Well this policeman also had a good vantage point but he is looking away from the stage he had work to do! 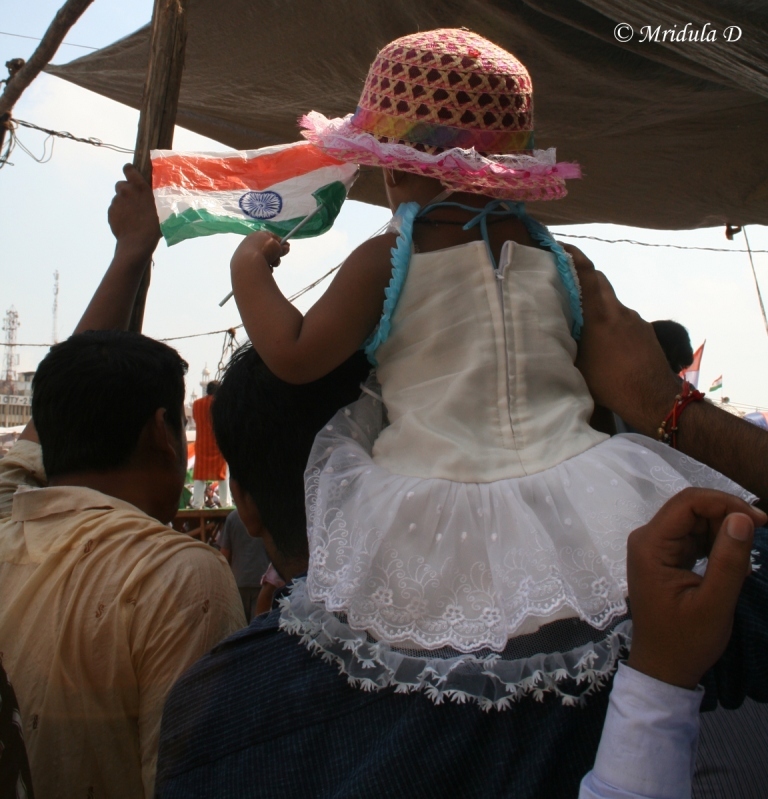 As there were last Sunday, there were kids today too, usually perched on their father’s shoulders like this small girl with her flag! 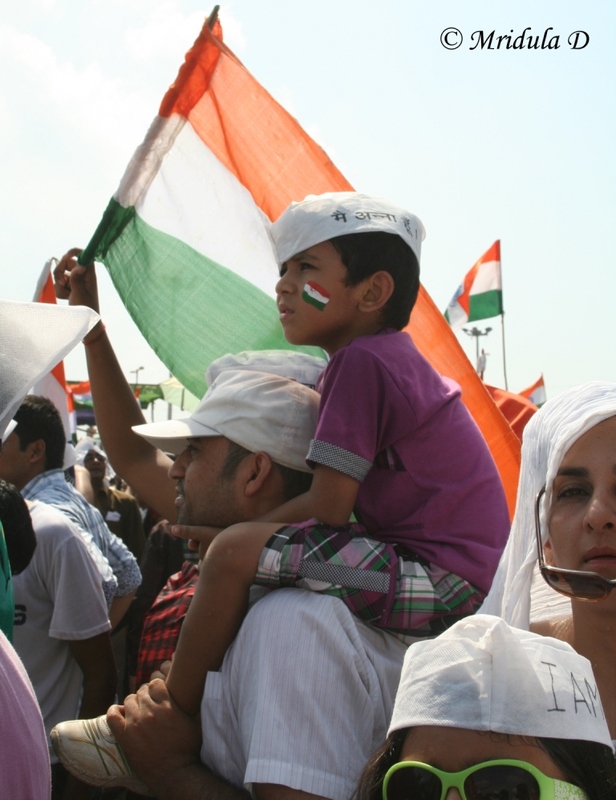 Another kid on his father’s shoulders and the national flag waving. Well it certainly was that kind of the day, when you needed your dark glasses! 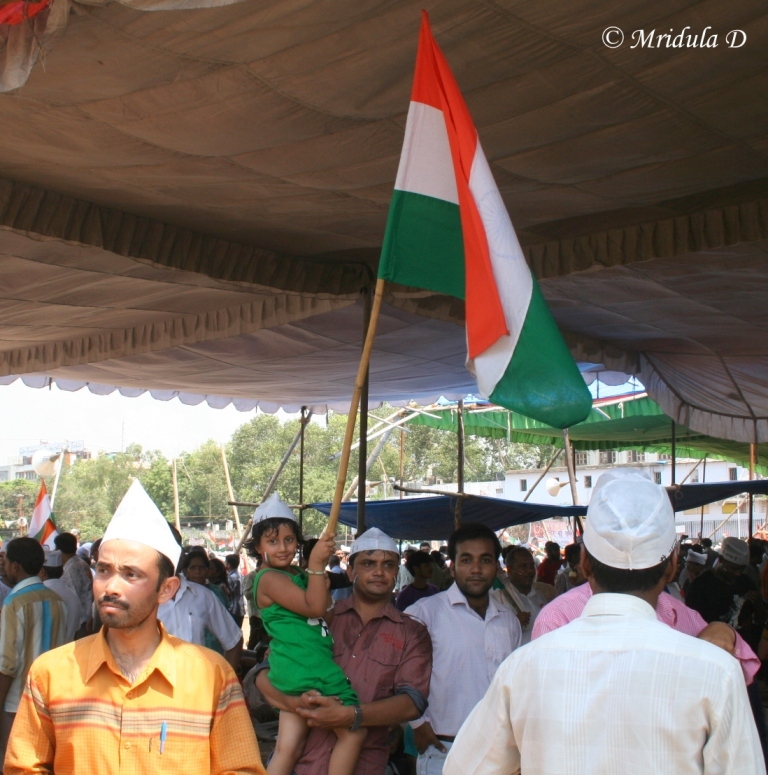 She was smaller in size than the flag she was holding! 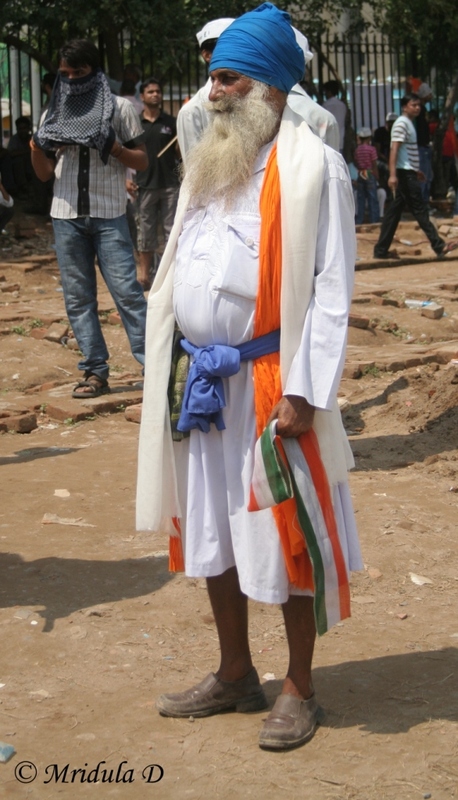 An elderly Sikh man at the Ramlila Maidan. I wonder how he braved the queues? 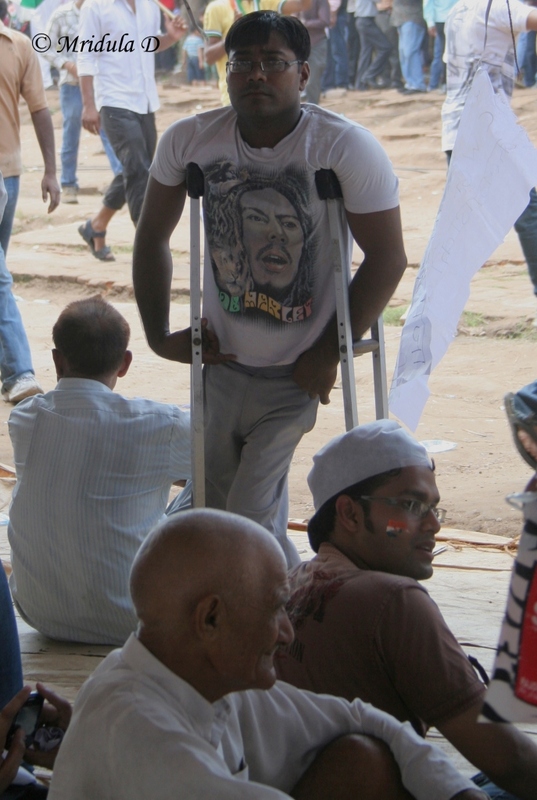 It was not easy with all the people trying to get in but there he was crutches and all. This gentleman told he that he used to dress as Ravana and come and it would take him hours to get out because so many people would click his picture. He wanted me to click this picture and I gladly obliged. I actually like to click people who are almost always behind the camera. Well it was that kind of a day, sultry and humid, so no wonder he fell asleep, only there was so much commotion around him, he probably was really tired. 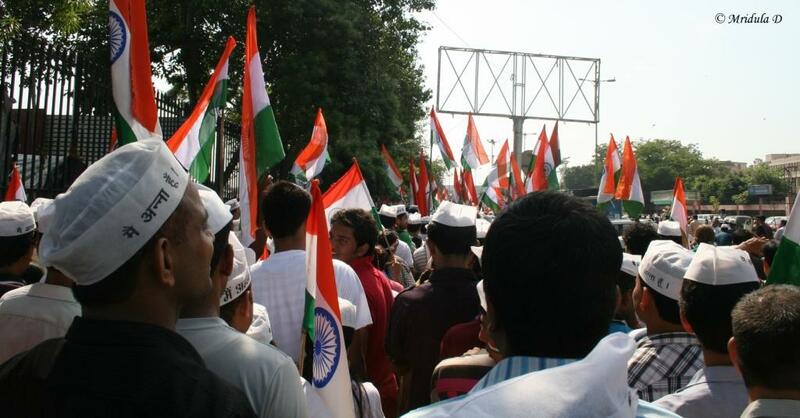 People coming out of the Ramlila Maidan after Anna Hazare broke his fast and what a crowd it was! 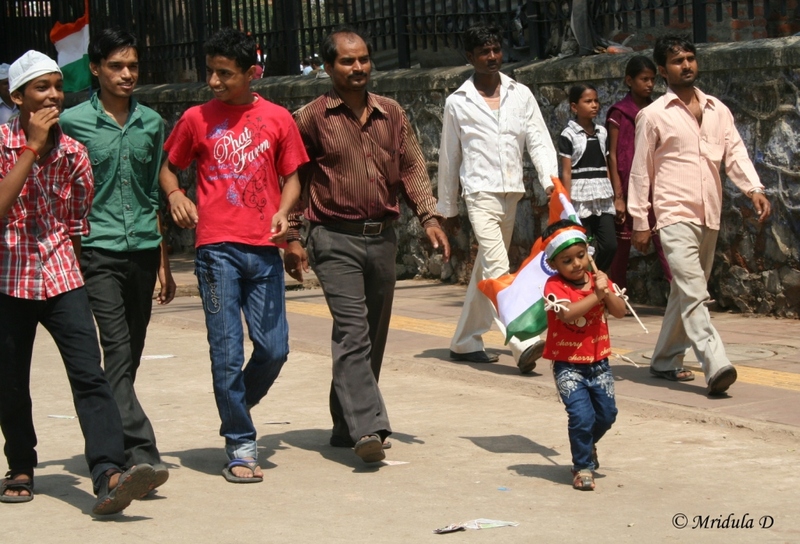 And there was this little leader of the pack! New Delhi Metro Station, Gates Closed For a While! 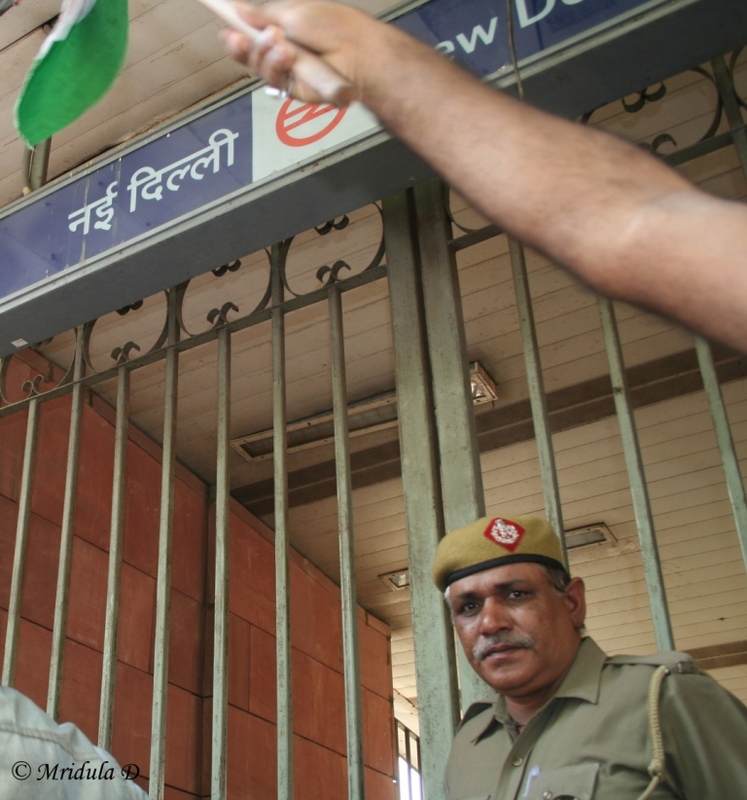 When the meeting ended there were so many people heading to the New Delhi Metro Station that gates had to be closed. The entry had to be regulated so that the station could function but I will write a separate post on this. I think that sums it up well? Thank you Anna. I have to admit I could not go anywhere near the main stage today. 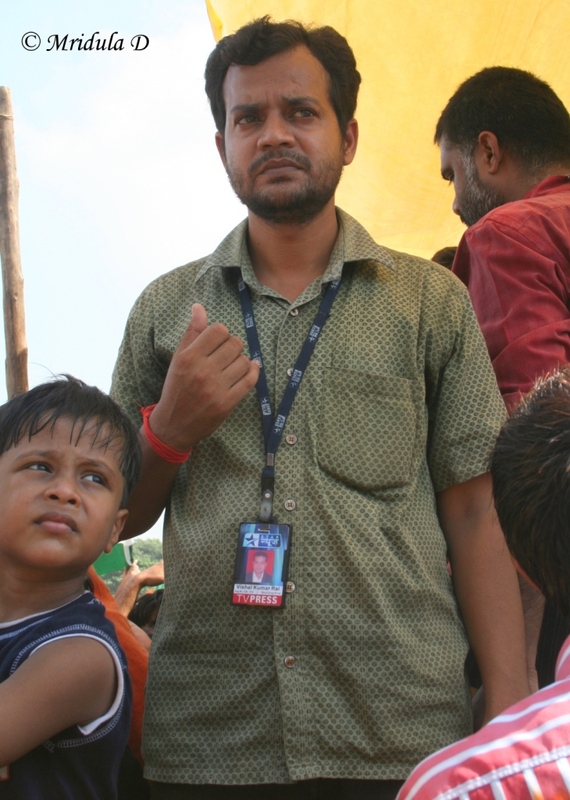 These pictures are clicked by a kind soul who was standing in the NDTV media enclosure. 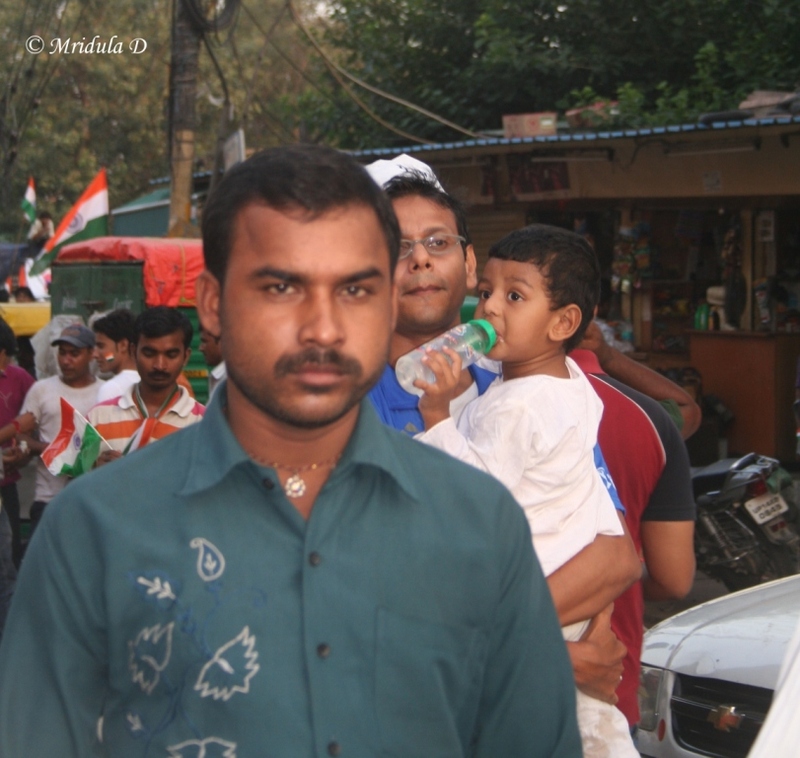 I gave him my camera and he clicked these pictures for me. 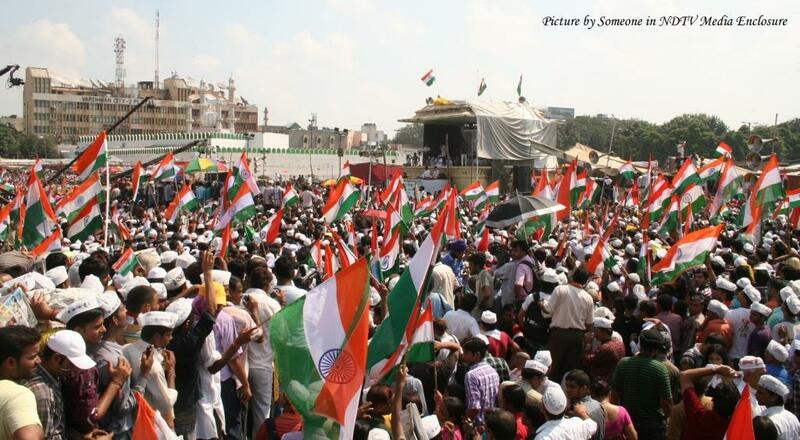 I feel if I could brave this crowd maybe I can brave the crowds at the Kumbh Mela too? 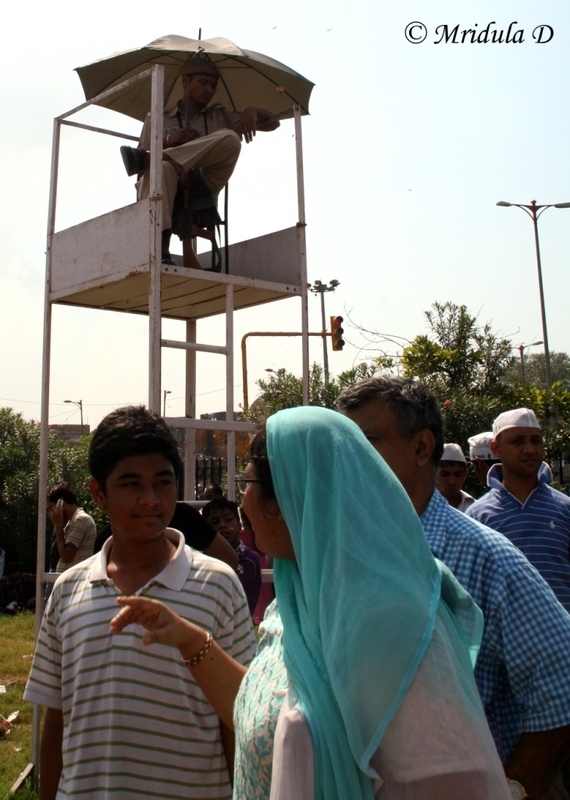 The media enclosures were a big magnet for the crowd as they were the only place where some elevation was possible. That or people who managed to climb some trees. I have to admit I am not a big fan of NDTV but I am quite thankful to the person who clicked these pictures for me. 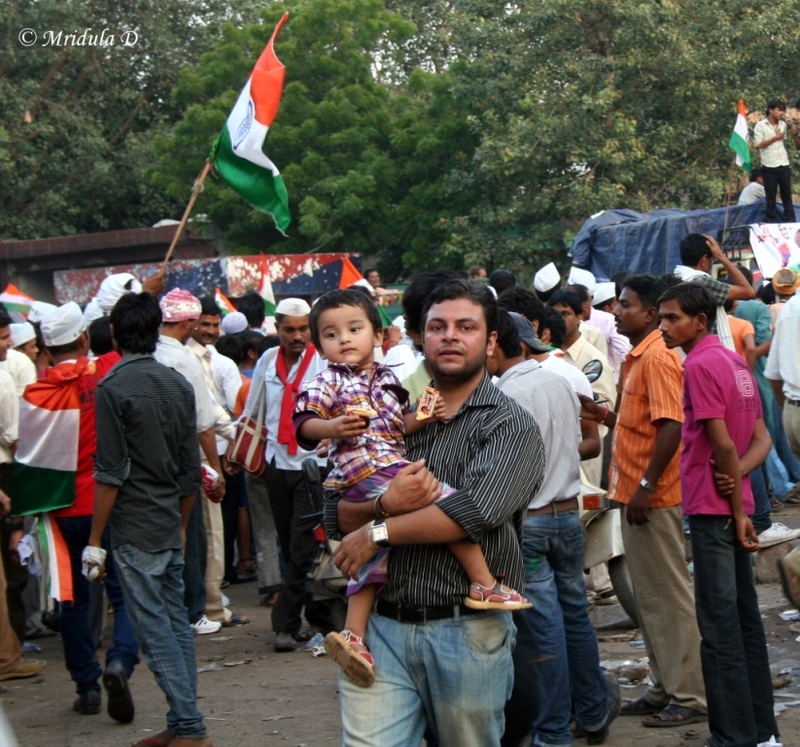 At Ramlila Maidan so many people turned up with their kids!